I thought I was alone in finding these difficult to work with! Sure, the wear is phenomenal, but I suspect sucking on a sharpie would leave an impressive stain too…. This colour works so well on you :). I agree with you on this, wine is the new red! I’ve been totally obsessed with this colour for the past few months, haha. I have the same lipstick in 107 but I honestly did not experience the tricky formula. Gorgeous shade, I really want to try some from this range. I’ve only purchased one from this range and must say I was pleasantly surprised. It I wasn’t bad at all for the price but I agree, it’s not all that. It’s a nice range for colors I wouldn’t wear every day. Absolutely love this post!! 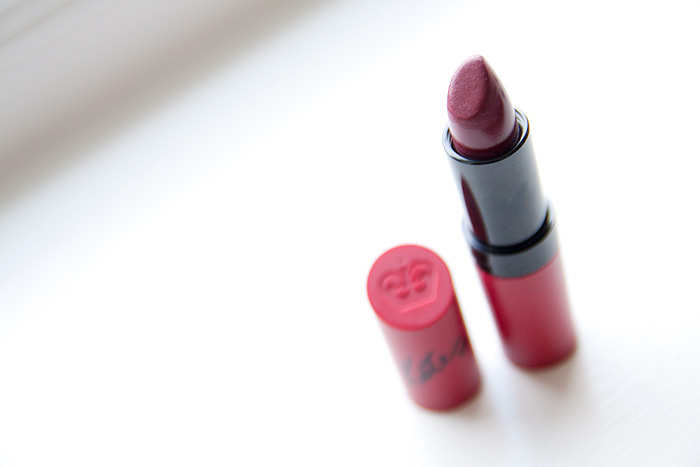 Beautiful lip color!! Grainy lipsticks make me wear them for 5 minutes before I am wiping it off! looks great on you! I’d just recommend you something a bit lighter for the brows with this new color, tried the new mac brow gels yet? 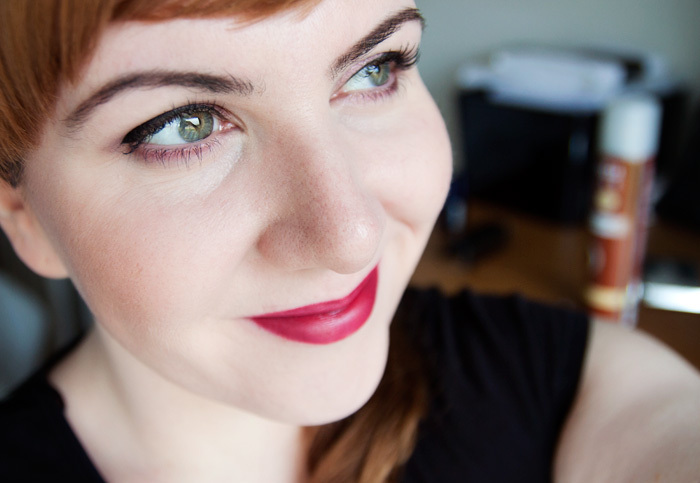 Question about the KM lipsticks: I noticed that UK bloggers have the ones in the red tube. Is this type only sold in the UK? In America, we have the Kate Moss lipsticks in the black tube. I have never seen the ones in the red tube. Sorry Chris, I’m not sure! The red packaging is the matte finish, I live in the US and I have the red and black ones. I recently purchased this product and I didn’t experience the draggy effect, whatsoever I usually have to exfoliate bc of dryness but this gave me no problem at all. I get plenty of compliments from men and women. I love the color and the matte finish. I’m glad you talked about the graininess I felt that too (& still feel it). I’m not a fan of the formula/application either but I love the colour (though I feel it makes me look/feel slightly like an old woman if I apply it full on). I also have 107 I didn’t know it was called Wine Hehe now I can say Wine instead of 107 (makes me feel like I’m in a bond movie) Cheers.